Compatible with WooCommerce 3.0.x, WooCommerce 2.6.x, WooCommerce 2.5, bbPress 2.5.x. The League has been tested with browsers IE10, IE11, Firefox, Safari, Opera, Chrome, Edge. 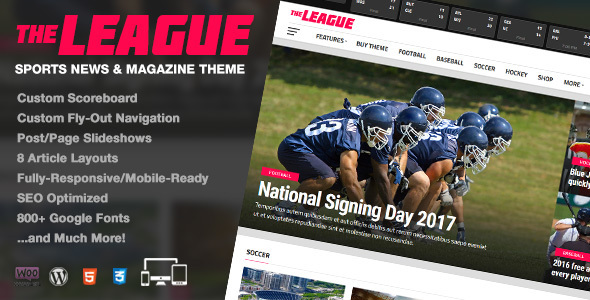 Theme The League - Sports News & Magazine WordPress Theme has the following features: One Click Demo Import, Google AMP Ready, Includes $53 worth of plugins, free!